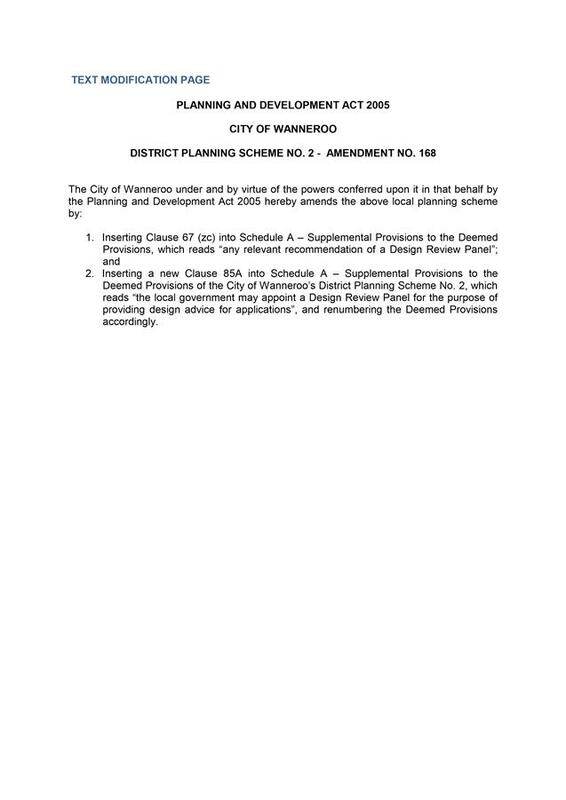 b) Inserting a new Clause 85A into Schedule A – Supplemental Provisions to the Deemed Provisions of the City of Wanneroo’s District Planning Scheme No. 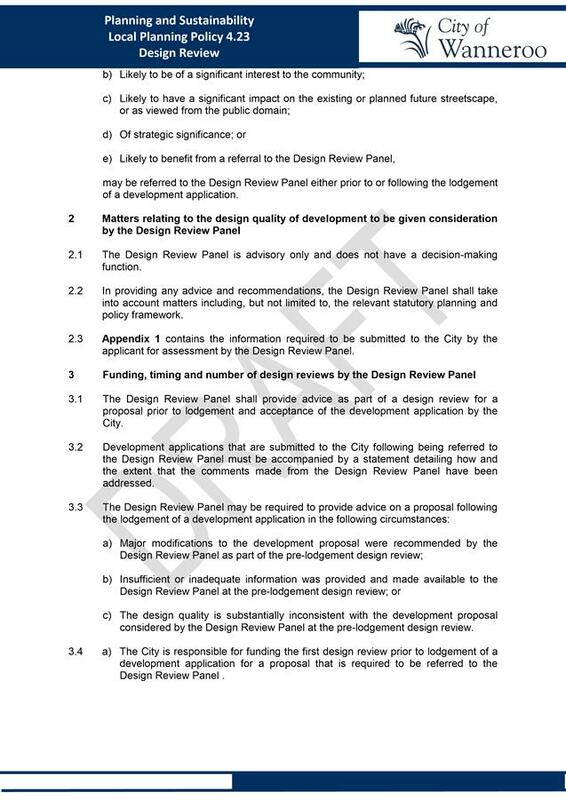 2, which reads “the local government may appoint a Design Review Panel for the purpose of providing design advice for applications”. · The information to be provided to enable the DRP to consider an application. 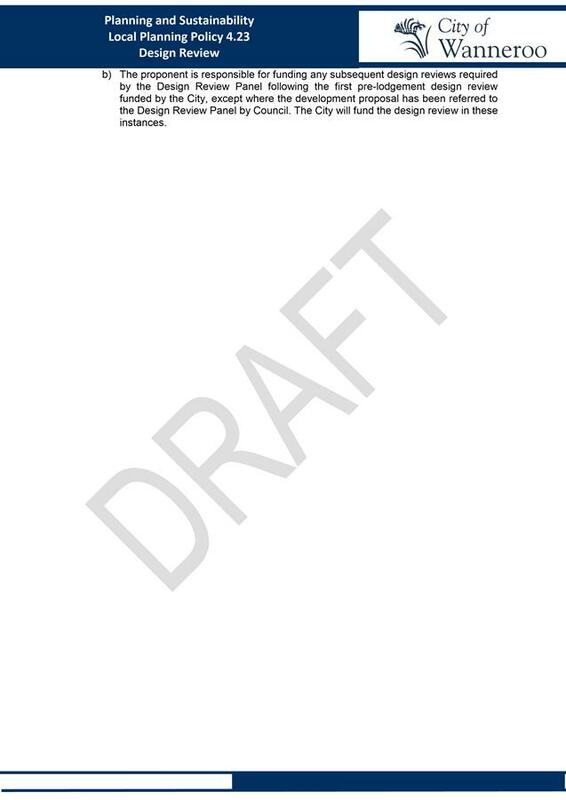 A copy of the advertised version of Draft LPP 4.23 is included in Attachment 1. · The operation of DRP meetings. 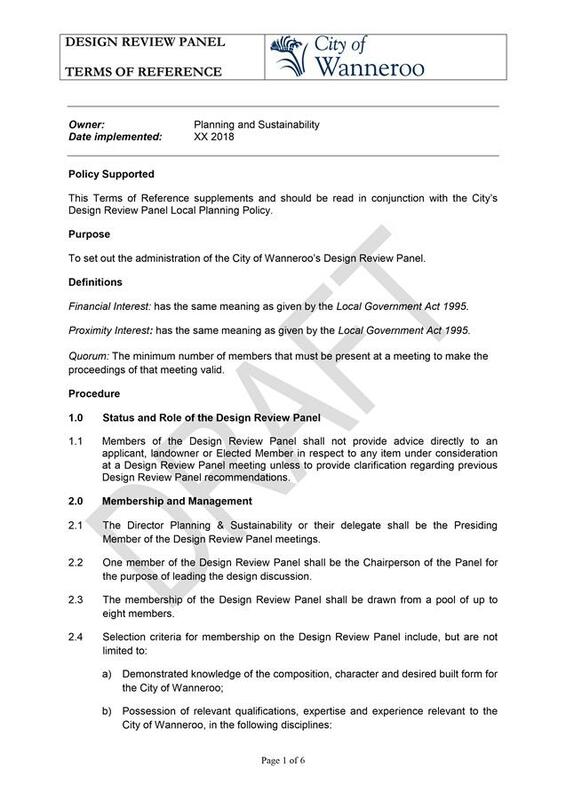 The Terms of Reference contained in Attachment 2 have been modified from the version included in the 1 May 2018 Council Meeting, which was previously referred to as a Management Procedure. A discussion of the modifications made is included in the Comment section below. 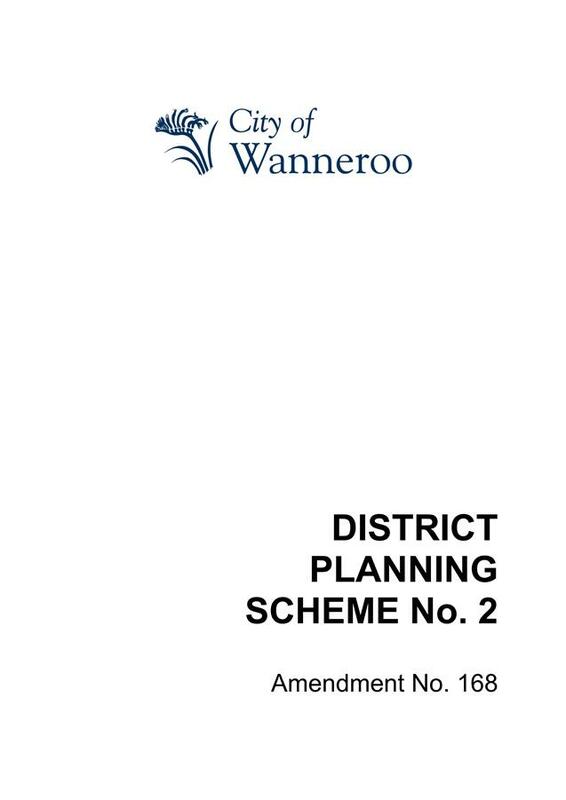 · Insert a new Clause 85A into Schedule A – Supplemental Provisions to the Deemed Provisions of the City of Wanneroo’s District Planning Scheme No. 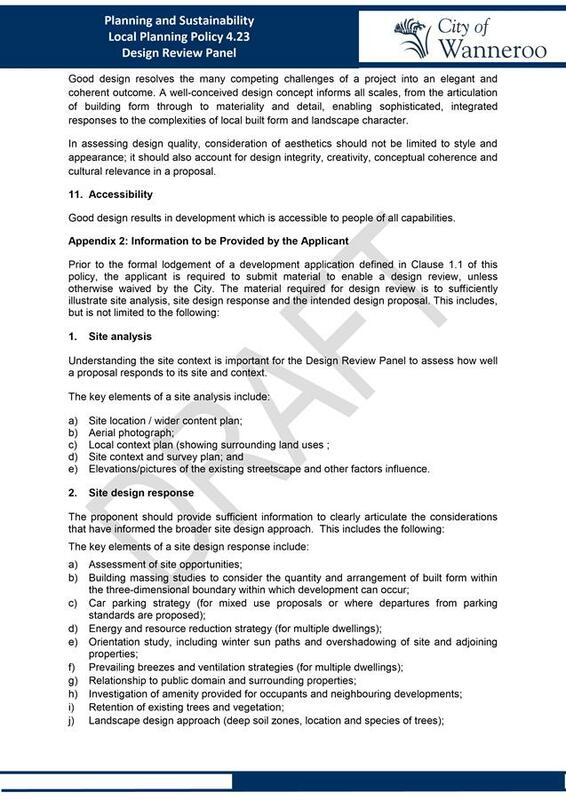 2, which reads “the local government may appoint a Design Review Panel for the purpose of providing design advice for applications”. 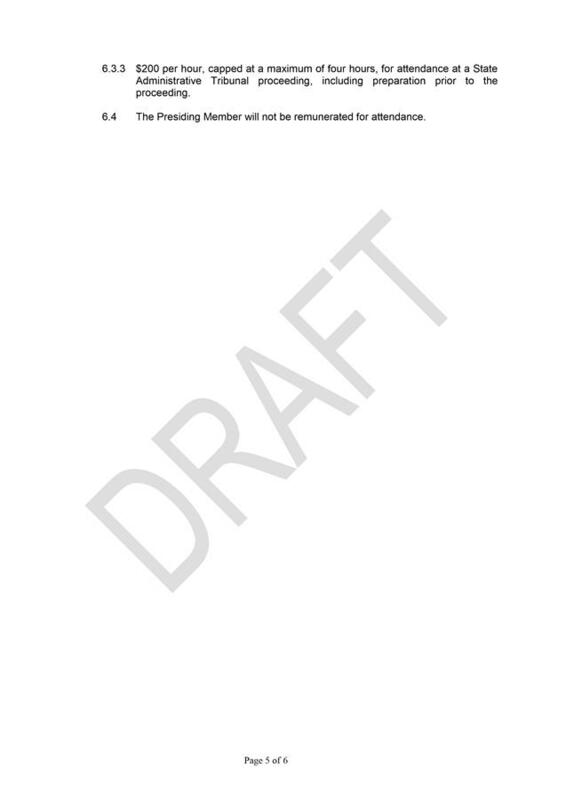 The report for proposed Amendment No. 168 to DPS 2 is included as Attachment 3. In accordance with Regulation 34 of the Planning and Development (Local Planning Schemes) Regulations 2015, Amendment No. 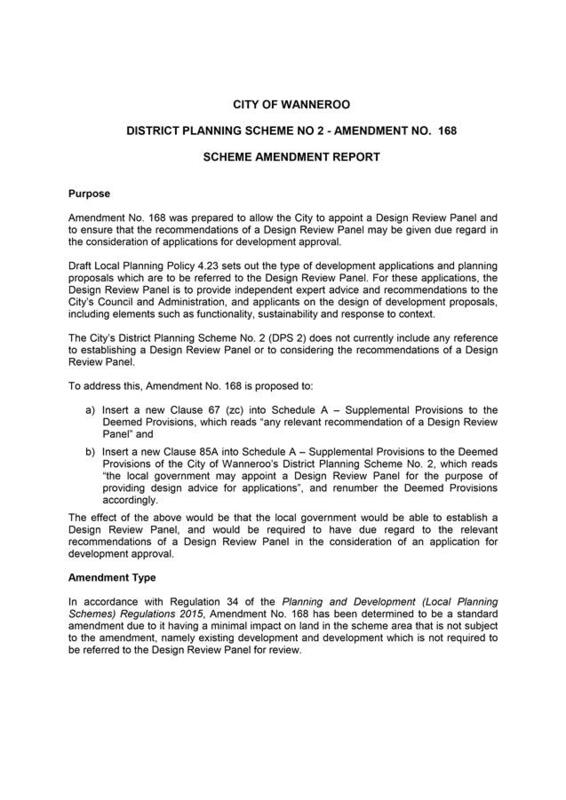 168 to DPS 2 has been determined to be a standard amendment due to it having a minimal impact on land in the scheme area that is not subject to the amendment, namely existing development and development which is not required to be referred to the DRP for review. · Written notification to the Office of the Government Architect, the Department of Planning, Lands and Heritage, Urban Development Institute of Australia, and other key stakeholders. 4. 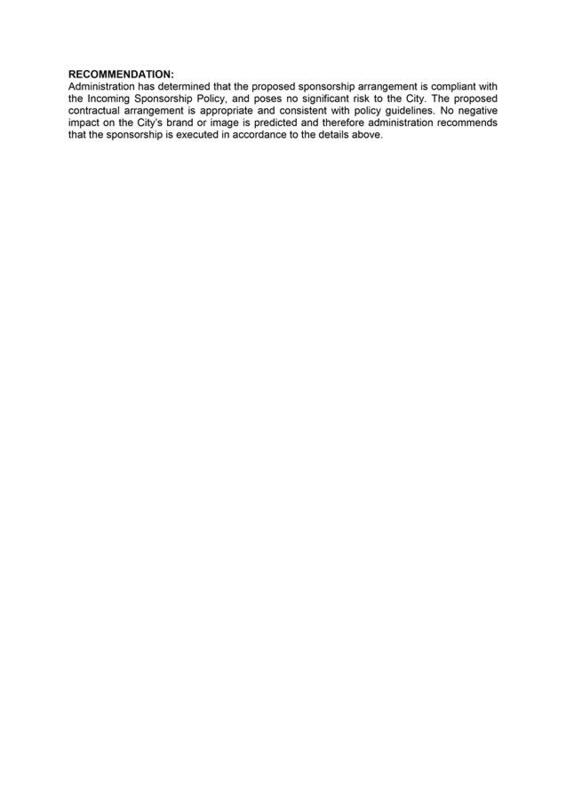 Department of Communities (DoC) – no objection with comments. A summary of the submissions received, and Administration’s response to these, is included in Attachment 4. 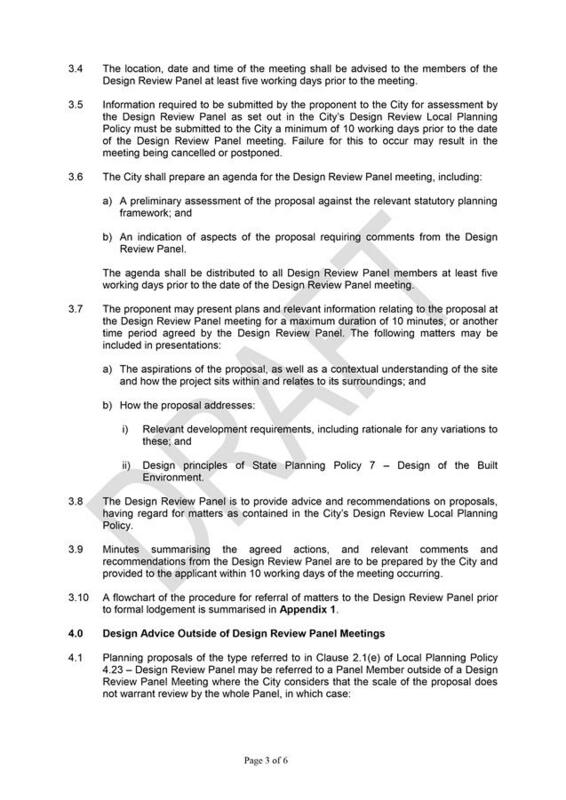 It is not necessary to advertise the Terms of Reference for public comment as they outline the scope in which the City’s DRP will operate and do not outline a principle of action or policy position which requires Council endorsement. If Council resolves that Amendment No. 168 is a standard amendment, in accordance with Regulation 47(2) of the Planning and Development (Local Planning Schemes) Regulations 2015, it must be subject to public consultation. The amendment will also need to be referred to the Environmental Protection Authority (EPA) to assess the environmental impacts of the proposal and to determine whether any formal environmental assessment is necessary. · Referral in writing to affected persons/agencies. · Any other way the local government considers appropriate. Following the 42 day advertising period, a summary of submissions received and Administration’s responses to those submissions will be included in a report to Council to consider supporting Amendment No.168 to DPS 2. Following the advertising of LPP 4.23, Administration has identified a list of modifications to the version which was advertised. These modifications are outlined in Attachment 5, and have been made in response to some of the submissions received during the advertising period, as well as consideration of the operation of DRPs of other Local Governments. The key modifications proposed by Administration are discussed in further detail below. 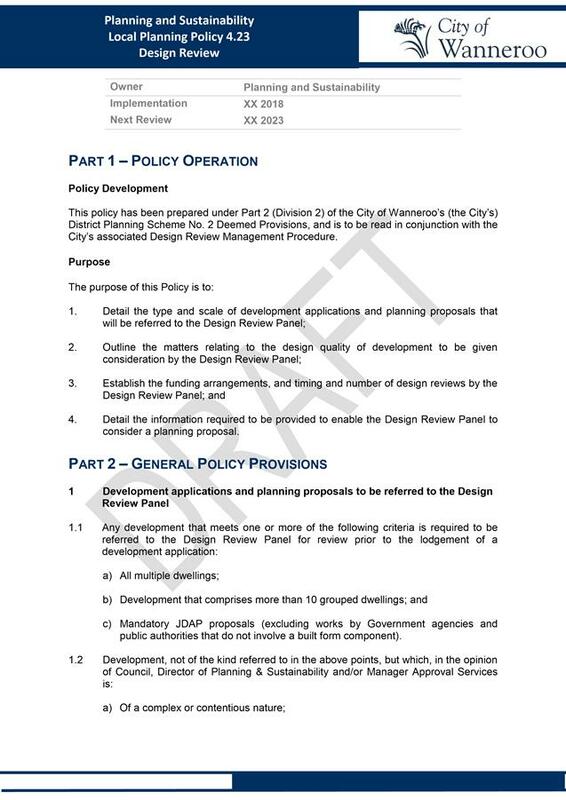 Draft LPP 4.23 has been modified to specify that development which is required to incorporate a landmark feature under a Structure Plan or Local Development Plan is to be referred to the DRP prior to lodgement of a development application. This is to ensure that high quality design is provided on key landmark sites within the City. 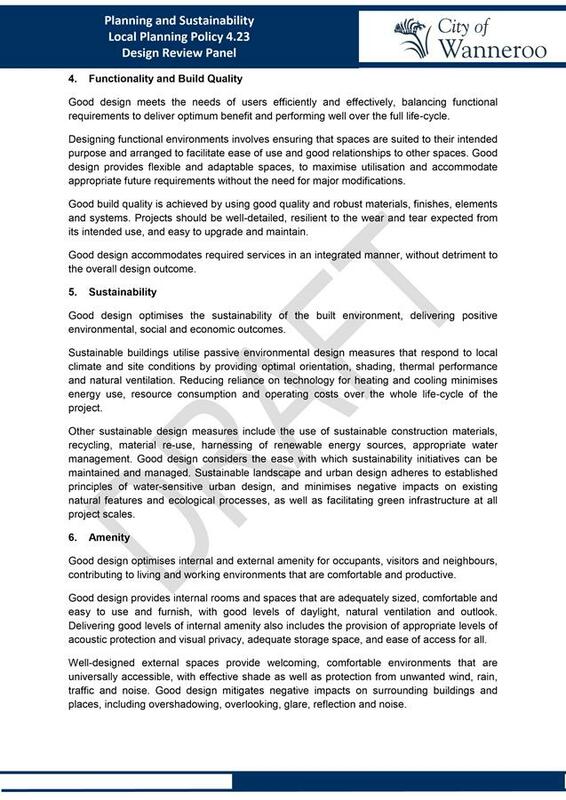 Draft LPP 4.23 currently proposes developments of more than 10 grouped dwellings be referred to the DRP. 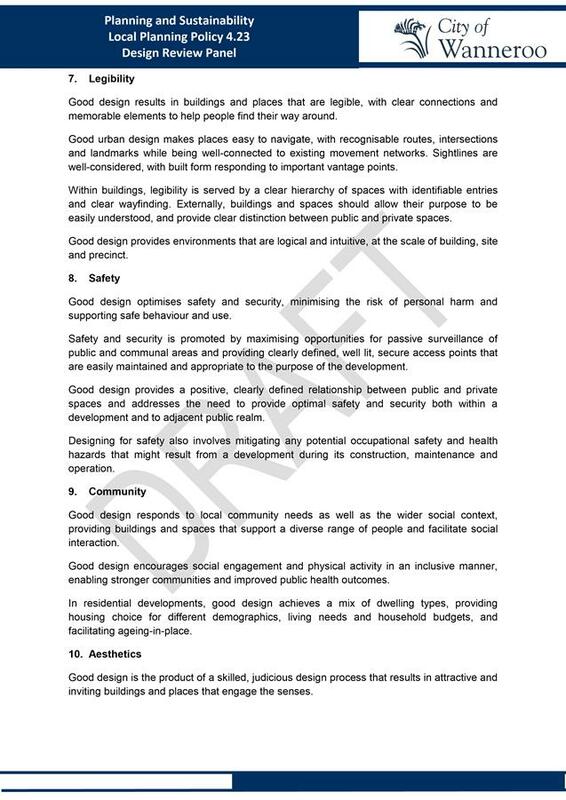 The OGA suggested that the threshold for grouped dwelling applications should be lowered to allow more of these proposals to benefit from design review, referencing a number of common design flaws with smaller-scale grouped dwelling applications, such as windowless bedrooms and lack of on-site landscaping. The OGA has suggested that the design review for developments that comprise of less than 10 grouped dwellings could be carried out by an individual with appropriate expertise, rather than the whole DRP. Contrary to the OGA’s position, the HIA has raised concern with the likely cost and time implications of a DRP review for smaller-scale residential developments, and has therefore recommended that all grouped dwellings under four storeys in height be exempt from the DRP process. 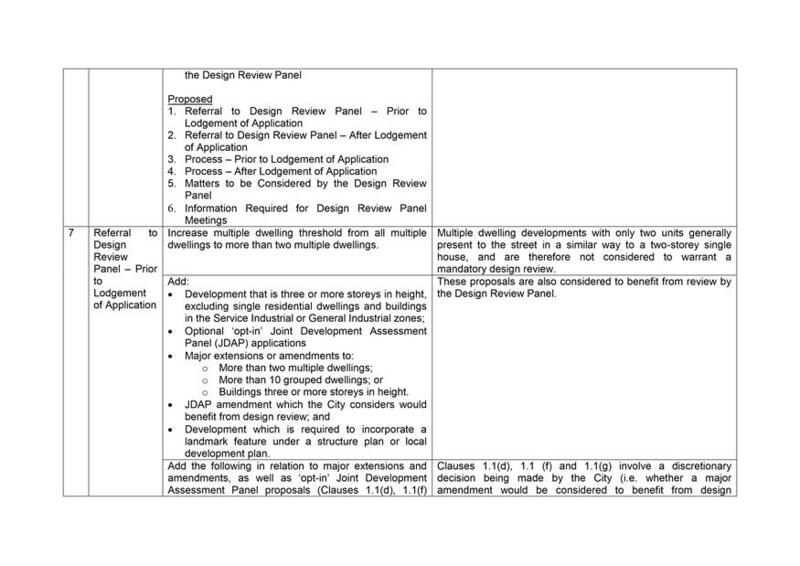 The timeframe and cost implications for design review are discussed in further detail below. Administration supports the OGA’s position, and agrees that some smaller-scale grouped dwelling developments may benefit from a design review. Administration also agrees that the review of smaller-scale grouped dwellings could be undertaken by an individual with appropriate expertise, rather than the whole DRP. 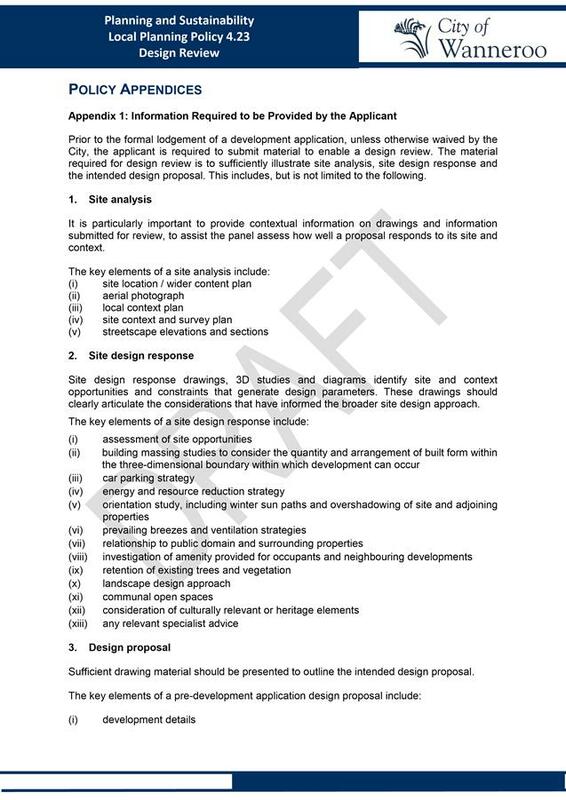 This approach is contemplated in the draft Design Review Guide, which states that ‘there will be cases where a full design review panel is not warranted, with assessment instead being carried out by an individual design review panel member’. 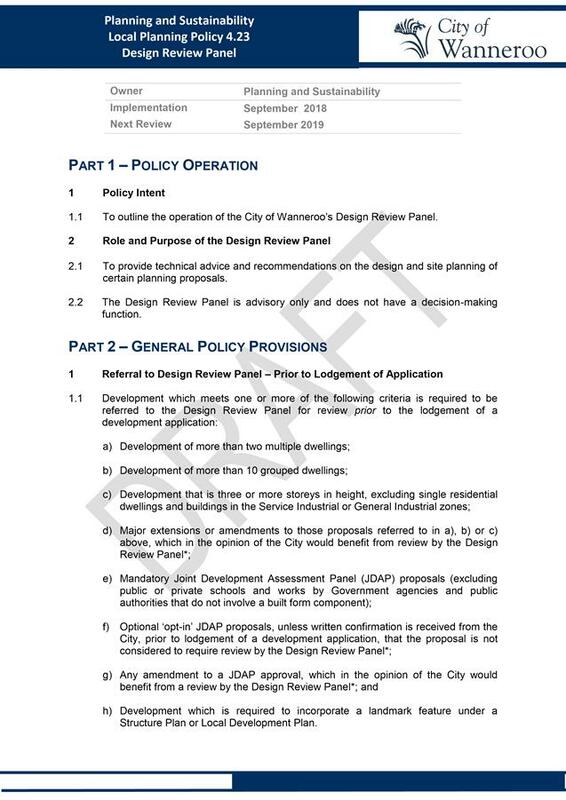 The advertised version of draft LPP 4.23 contained a provision allowing the City to exercise discretion to refer a proposal to the DRP where it considers that the proposal would likely benefit from design review. This provision has been retained in the modified version of draft LPP 4.23. 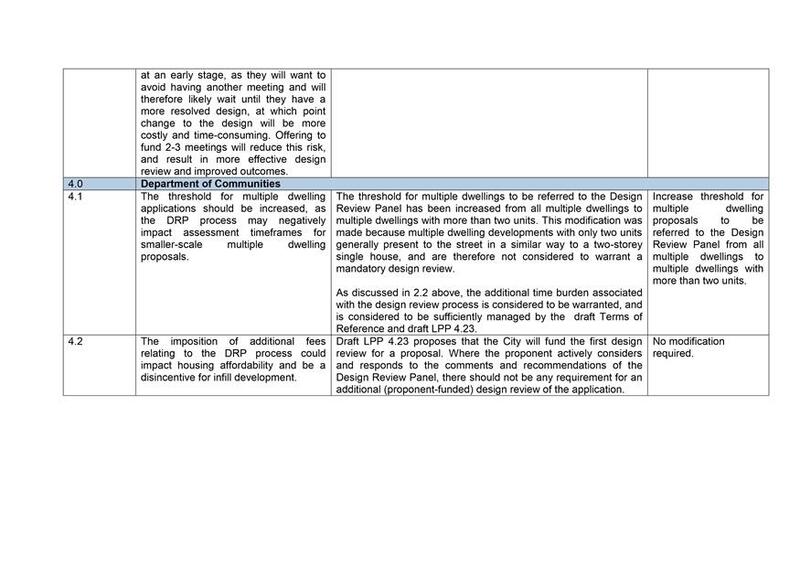 If the City considers that a proposal with 10 grouped dwellings or less would benefit from design review, the proposal could be referred to the DRP in accordance with this provision. 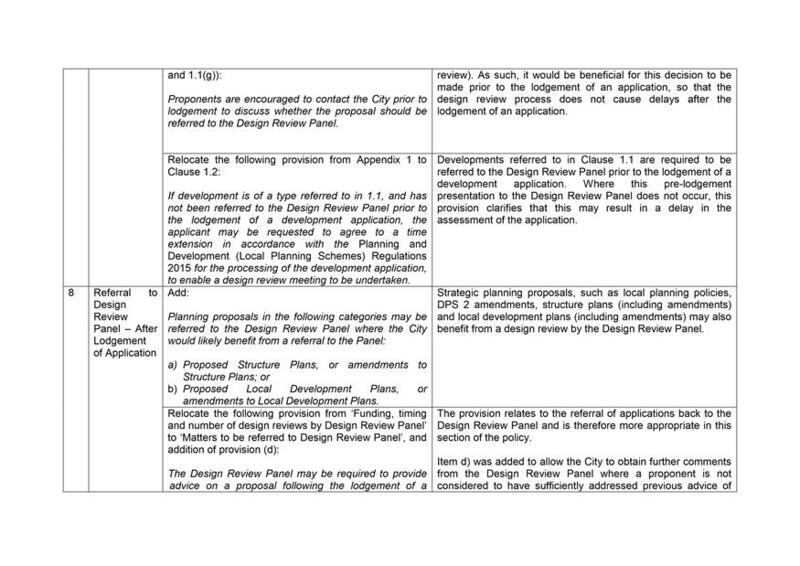 The Terms of Reference has been modified to allow for design advice to be requested outside of DRP meetings. This would allow for smaller-scale proposals (such as the development of 10 grouped dwellings or less) to be referred to a single member of the DRP, avoiding the higher cost and longer time-frame associated with a full DRP meeting. This approach is consistent with the submission received from the OGA, and the draft Design Review Guide. 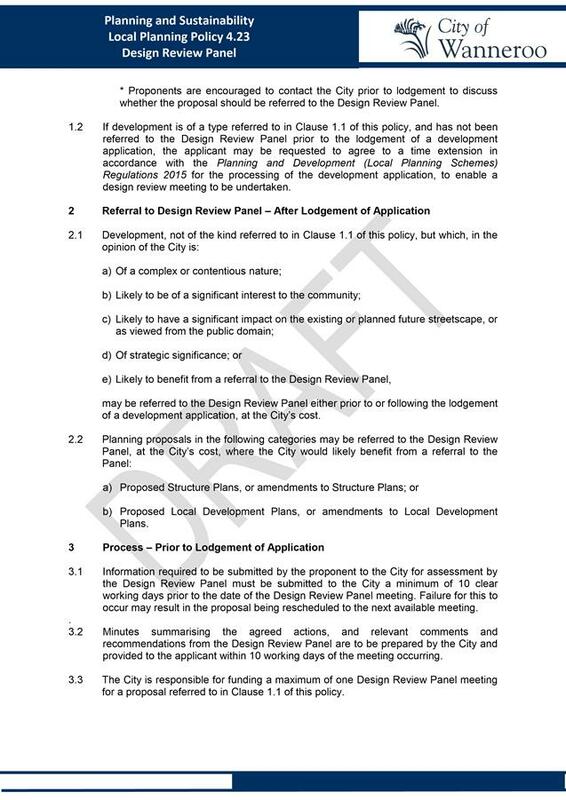 Draft LPP 4.23 proposes that the City is responsible for funding the first design review, which is to occur prior to the lodgement of a development application (or other planning proposal). 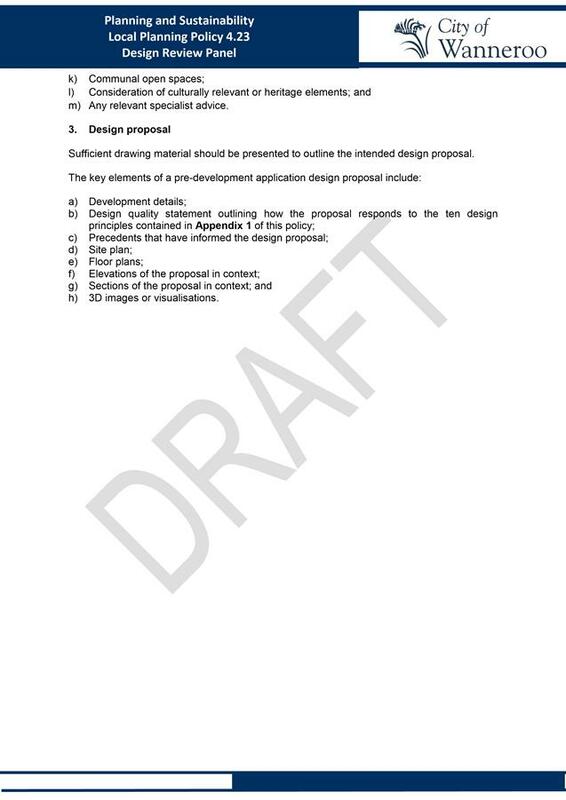 If further design reviews are required for a particular proposal, draft LPP 4.23 proposes that these be funded by the proponent. 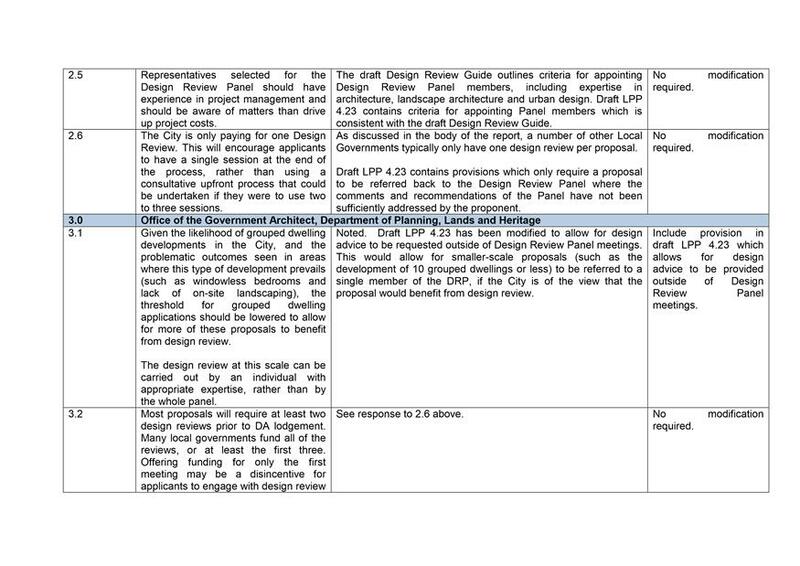 In their submission on draft LPP 4.23, both the OGA and the HIA have suggested that Administration’s proposed funding arrangement may act as a disincentive for early design review and that developers may submit proposals with very resolved plans as close as possible to the submission of the development application in the hope of reducing the likelihood of a subsequent design review. It is the OGA’s view that at this stage of the process, change to the proposal is more difficult and costly. Both the OGA and the HIA have suggested that the City should fund more than one design review. The DoC also suggested that the imposition of additional fees relating to the DRP process could impact housing affordability and be a disincentive for infill development. 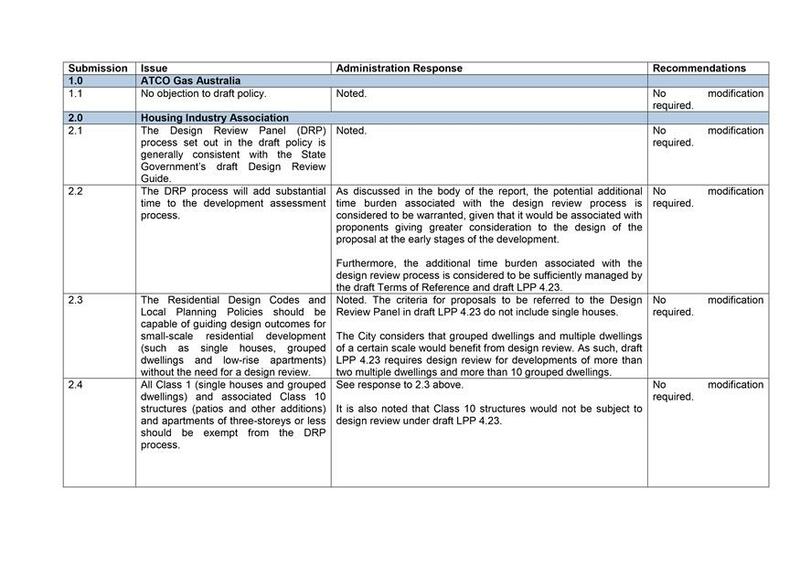 As detailed in Attachment 6, a number of other Local Governments, including the City of Joondalup, typically have only one design review per proposal. 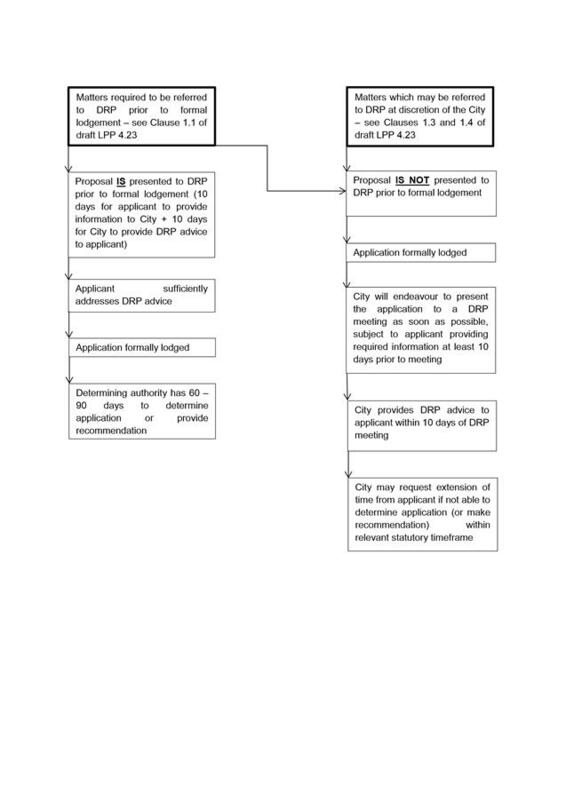 In the DRP process at the City of Joondalup, the City Officers are responsible for reviewing any amended plans and justification provided by the proponent to determine whether the comments and recommendations of the DRP have been sufficiently addressed. The application may be referred back to the DRP if the City Officers do not consider that the comments and recommendations have been sufficiently addressed. 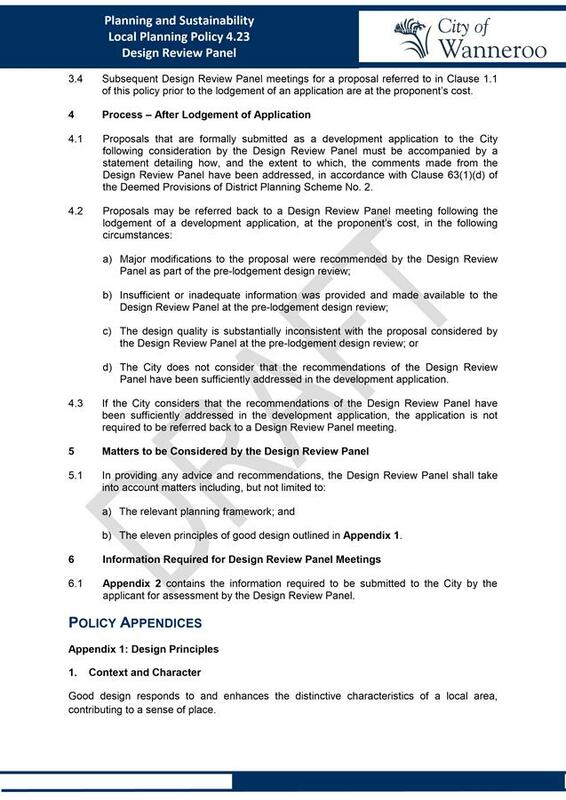 · Clause 4.2(d), which requires applications to be referred back to the Design Review Panel where the City does not consider that the comments and recommendations of the Design Review Panel have been sufficiently addressed. As detailed above, it is possible and commonplace in other Local Governments for a proposal to only be presented to a DRP meeting once, if the proponent actively works to address the comments and recommendations from the DRP meeting. 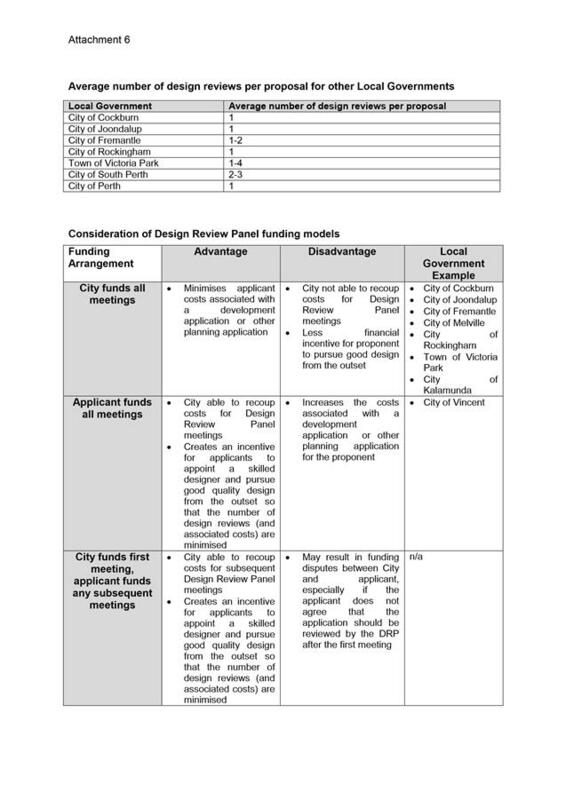 The draft Design Review Guide sets out three DRP funding models for consideration, being local government funded, proponent funded, or a balance of local government and proponent funded. A consideration of the advantages and disadvantages of each funding model is provided in Attachment 6. Administration’s view is that the funding model proposed by draft LPP 4.23 will create a financial incentive for proponents to appoint a skilled designer and pursue good quality design from the outset, so that proposals do not need to be referred back to the DRP following the initial review. In their submission, the HIA raised concern that the design review process would add substantial time to the development assessment process. The design review process may increase the time associated with preparing applications for those proposals which will require design review under draft LPP 4.23. However, this potential time burden is considered warranted, given that it would be associated with proponents giving greater consideration to the design of the proposal at the early stages of the development, ultimately resulting in better quality developments. · Up to 10 working days for a DRP member to provide advice to the City, where advice is requested outside of a DRP meeting. Attachment 7 summarises the design review process in scenarios where the matter is presented to a DRP meeting before and after the formal lodgement of an application. 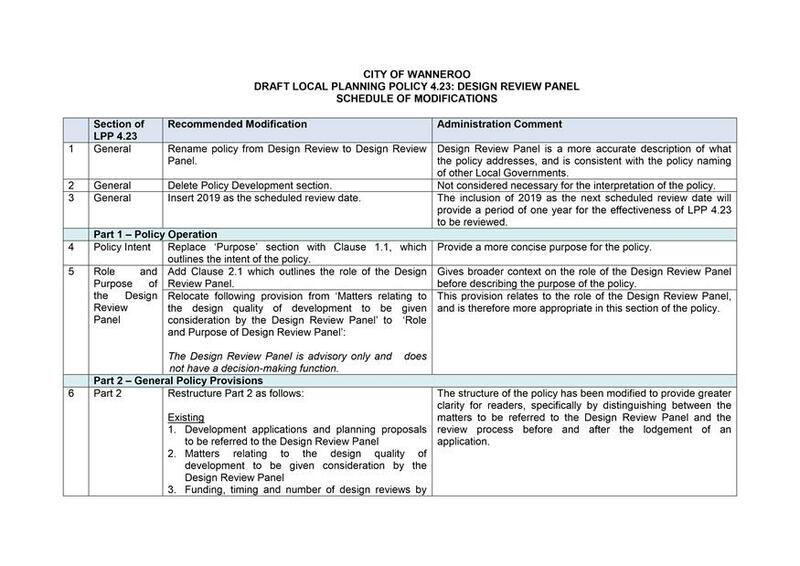 In light of the above, the additional time burden associated with the design review process is considered to be sufficiently managed by the Terms of Reference and draft LPP 4.23. 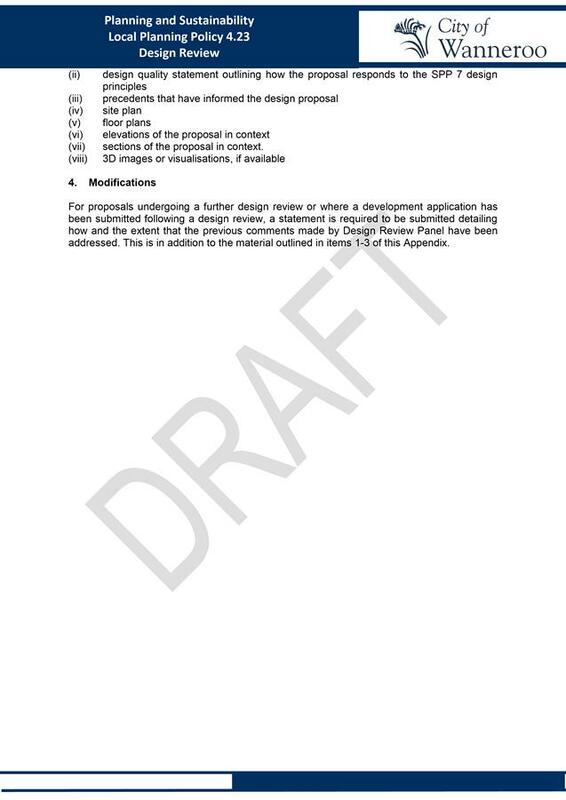 The final version of LPP 4.23, which incorporates the modifications discussed above, is included in Attachment 8.
b) Administration recommends that Council proceed with LPP 4.23 with the proposed modifications outlined in Attachment 5, and incorporated in the final version which is included as Attachment 8. 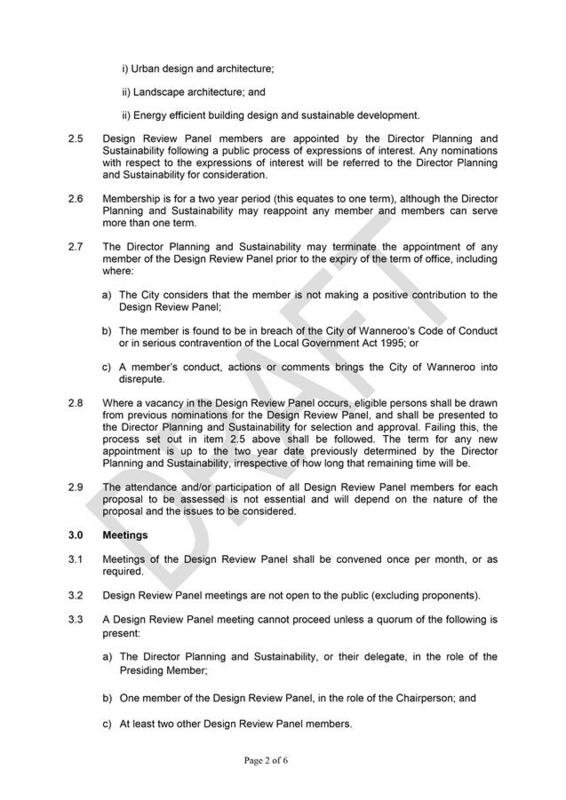 The only significant modification made to the Terms of Reference is specifying that the Panel members may be appointed by the Director Planning and Sustainability, rather than by the Council. This is because the DRP is not proposed to be a Committee under the the Local Government Act 1995, and therefore the appointing of Panel members by Council is not specifically required. As set out in draft LPP 4.23, it is intended for the DRP to provide technical advice and recommendations in an advisory capacity only and not to hold decision-making powers for applications. 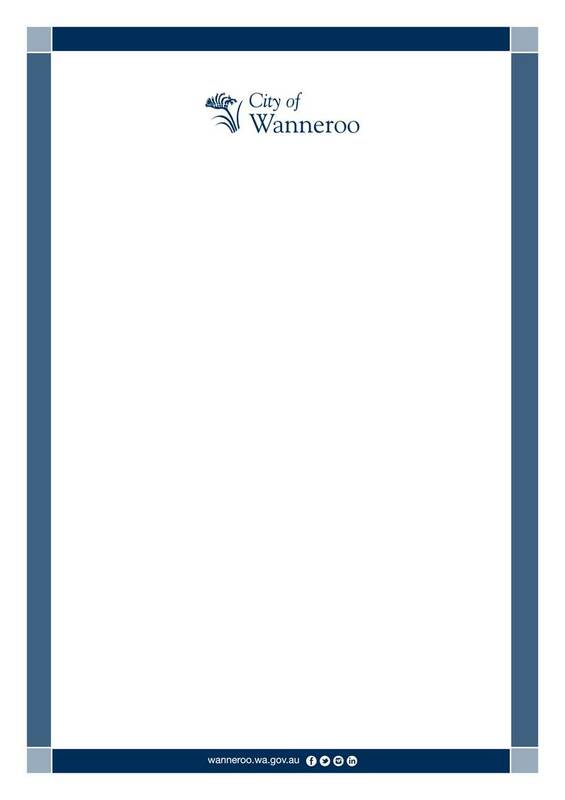 The preparation of draft LPP 4.23 has been informed by the Western Australian Planning Commission’s (WAPC) draft Design Review Guide, which sets out a best practice model for Local Governments to establish and operate design review processes involving one or a number (panel) of appointed experts. Administration has also liaised with a number of other Local Governments in the Perth Metropolitan Area who have established some form of DRP, in order to discuss details on the formulation, implementation and costs of their DRPs. Currently, DPS 2 does not include any reference to establishing a DRP, or to considering the recommendations of a DRP. As such, there is a need to amend DPS 2 to ensure that the City can establish a DRP and that the recommendations provided by the DRP has the status under DPS 2 as a matter that is to be given due regard in considering an application for development approval. Amendment No. 168 to DPS 2 has been prepared to ensure that the recommendations provided by the DRP has the status under DPS 2 as a matter that is to be given due regard by the relevant decision maker in considering an application for development approval. These costs have been established following a review of the remuneration offered by other local governments, and having regard to the time commitments necessary for each meeting. The proposed remuneration is intended to provide payment for the DRP members pre-meeting preparation, attendance at the meeting and review of the draft meeting minutes. Each meeting is expected to run for approximately two hours, however, this period may vary dependent on the number of proposals being considered and the depth of design commentary required. It is envisaged that a maximum of three proposals would be presented to a design review meeting. Based on the remuneration figures provided above, on the understanding each meeting would comprise a Chairperson and three other DRP members, each meeting will cost $1700. This cost does not include the work required to be undertaken by Administration to facilitate the meeting, including assessment of each proposal, preparation of a report, arranging the meeting and preparing minutes. An estimate of these Administration costs is provided in Attachment 9, and equates to $893 per meeting (based on three proposals per meeting). 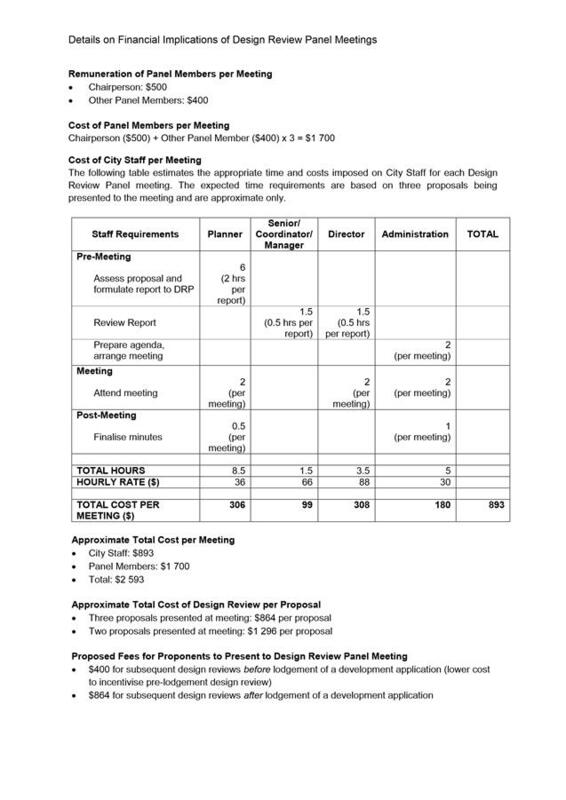 This brings the total estimated cost for operating each DRP meeting to $2593, equating to a cost of $864 per proposal (based on three proposals per meeting). It is intended that the City fund one pre-lodgement DRP meeting which will provide the proponent with the advice and recommendations of the DRP. Should the proponent seek further design advice prior to lodging a development application, this would be at their expense. A fee of $400 is proposed for an additional pre-lodgement design review meeting. Upon submitting a development application, the proponent will be required to provide a statement detailing how the advice and recommendations of the DRP have been incorporated into the proposal. 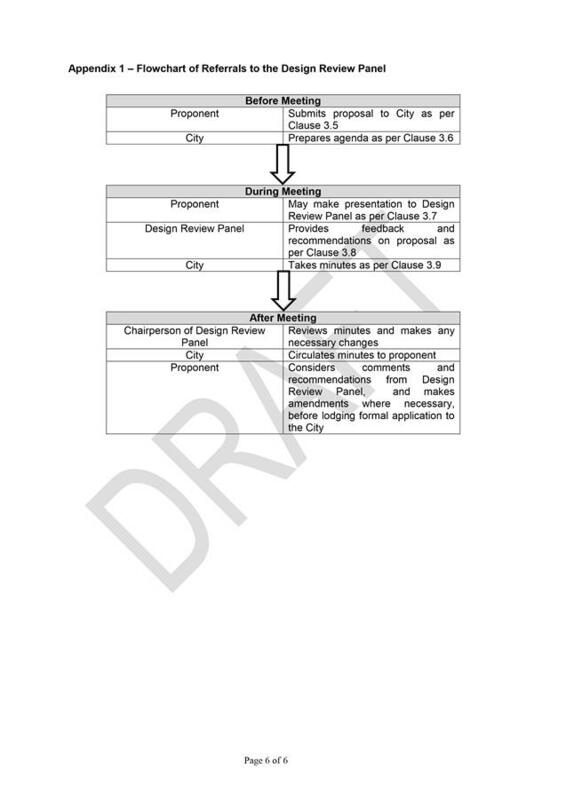 In instances where a development application is submitted, and the City does not consider the proponent has sufficiently addressed the advice and recommendations of the DRP, the proponent will have the opportunity to present back to the DRP to obtain support for the design of the submitted proposal, at a fee of $864. 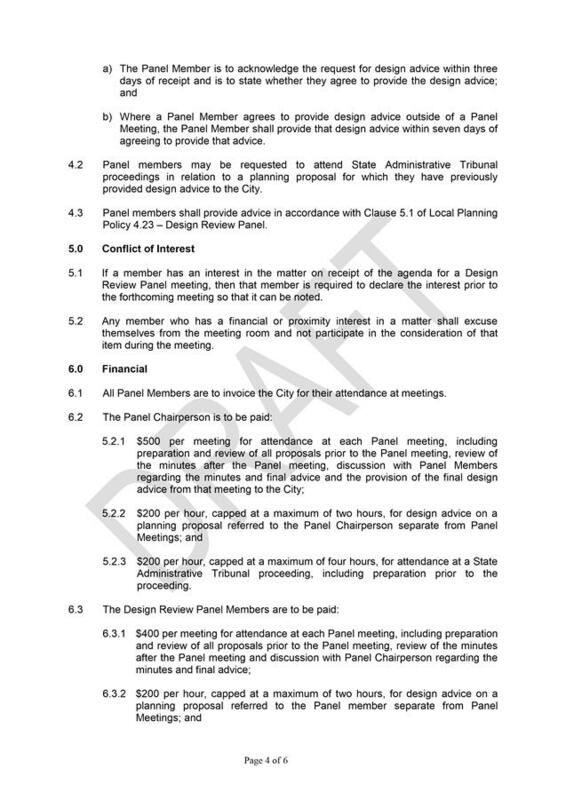 This fee is reflective of the estimated cost of DRP meetings per proposal, as outlined in Attachment 9. The intent of the above fee structure is to incentivise pre-lodgement design review advice. The making of LPP 4.23 was undertaken in accordance with Clause 4 of the Deemed Provisions of DPS 2. The scheme amendment process will follow the statutory process outlined in the Planning and Development (Local Planning Scheme) Regulations 2015. There are no existing Strategic or Corporate risks within the City's existing risk registers which relate to the issues contained in this report. There are no implications for other policies of the City. 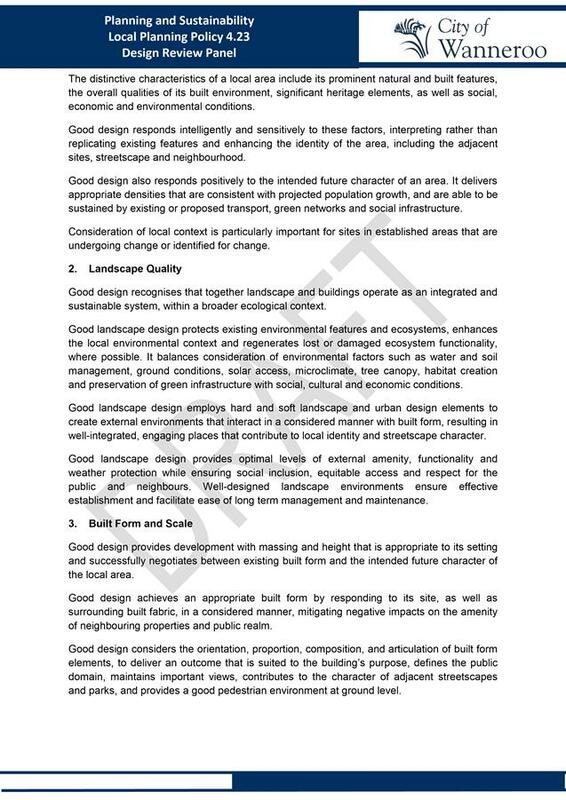 Notwithstanding, a number of the City’s Local Planning Policies may be reviewed to include design-related provisions in the future. Costs arising from the establishment of a DRP will have implications for the City’s financial planning. In anticipation of the DRP being established, funding of $100 000 has been included in the 2018/2019 budget. Consideration of the financial implications of the establishment of a DRP, including remuneration of panel members and fees for presenting to the DRP, are outlined in Attachment 9. Administration recommends that the Fees and Charges Schedule is amended to include the proposed fees for proponents presenting to the DRP. 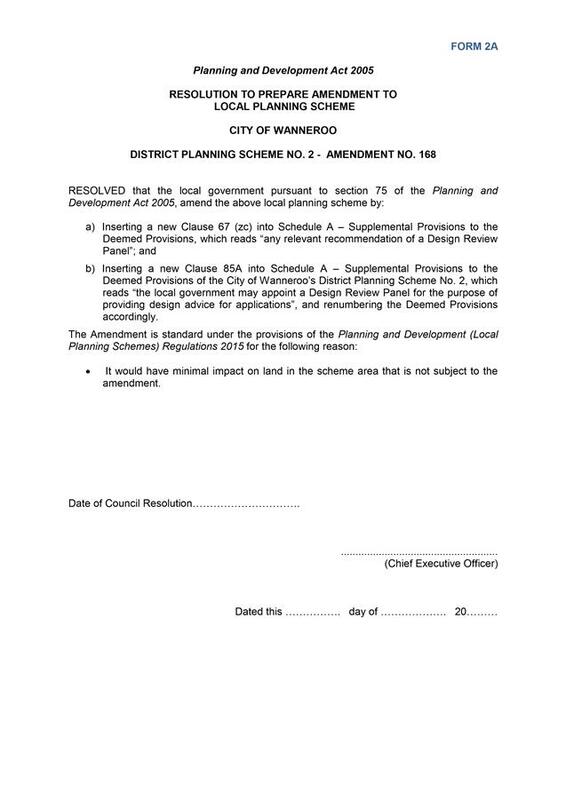 b) Insert a new Clause 85A into Schedule A – Supplemental Provisions to the Deemed Provisions of the City of Wanneroo’s District Planning Scheme No. 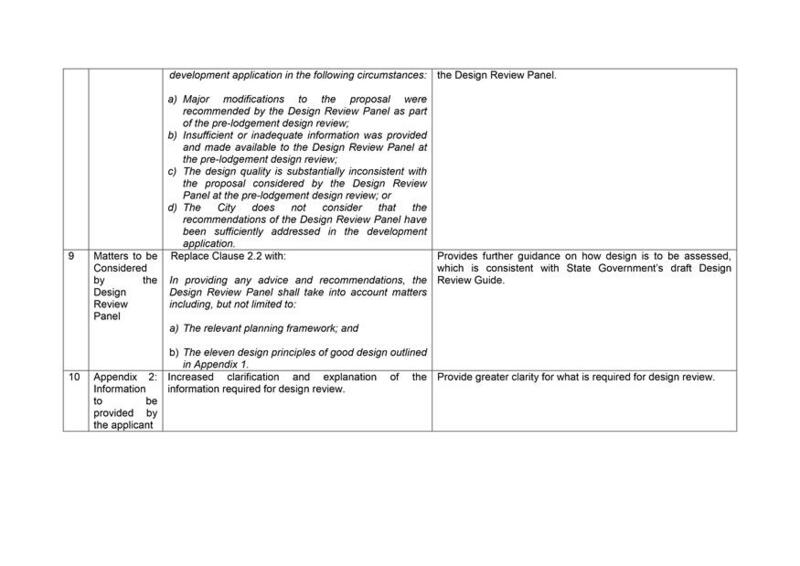 2, which reads “the local government may appoint a Design Review Panel for the purpose of providing design advice for applications”, and renumber the Deemed Provisions accordingly. a) It would have minimal impact on land in the scheme area that is not subject to the amendment. 7. Subject to EPA approval, ADVERTISES Amendment No. 168 for public comment for a period of 42 days. b) An $864 fee for proponents presenting to the Design Review Panel after an initial meeting funded by the City (after lodgement of a development application). To consider a sponsorship proposal received from Channel Nine Perth for the City’s 2018/19 community events season. · Global Beats & Eats. Channel Nine Perth is valued for covering local, national and international issues, events and news that are recognised across the nation. · TVC spot production valued at $15,000. · MC acknowledgment during event. Consultation with Channel Nine Perth has occurred in the lead up to formalising the proposed advertising air value. The sponsorship proposal received from Channel Nine Perth for the 2018/19 community events season represents a significant opportunity and contribution to the City and will enhance the media and promotional coverage of the events. The proposal aligns with the City’s Incoming Sponsorship Policy and represents an opportunity to further promote and engage our community in the upcoming events season. 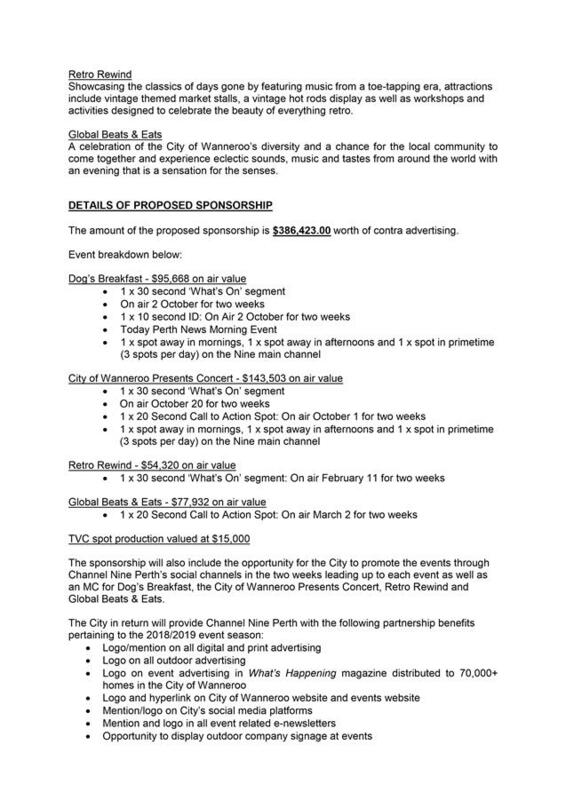 On this basis, it is recommended that the sponsorship proposal from Channel Nine Perth is approved. 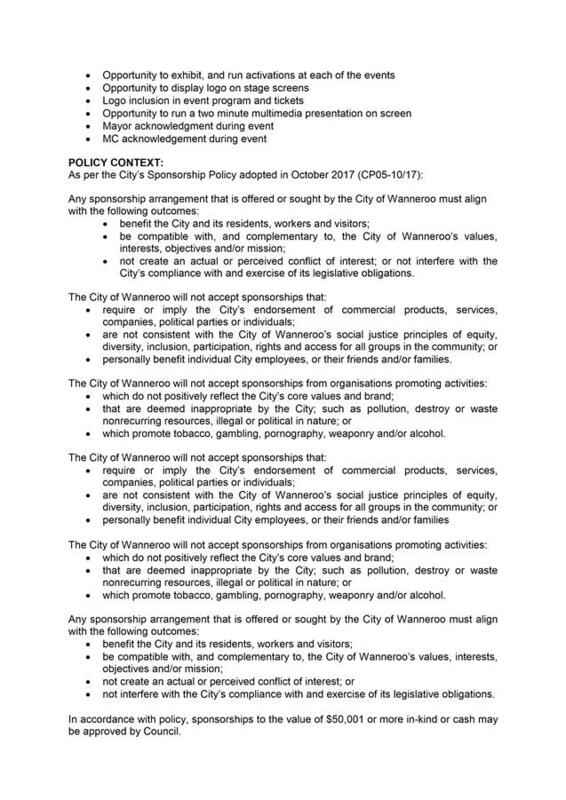 In accordance with the Incoming Sponsorship Policy, a risk assessment has been conducted in order to identify any potential risks to the City in entering into this sponsorship. Administration has determined that the proposed sponsorship arrangement is compliant with the Incoming Sponsorship Policy, and poses no significant risk to the City. The proposed contractual arrangement is appropriate and consistent with policy guidelines. 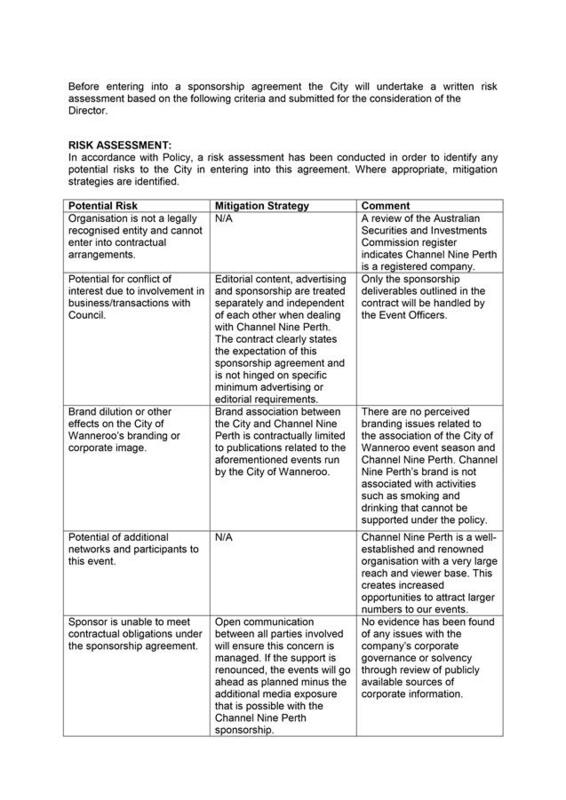 On the basis of the risk assessment, this sponsorship poses no significant risk to the City. · not interfere with the City’s compliance with and exercise of its legislative obligations. As the value of the sponsorship proposal is greater than $50,001 in accordance with the Policy, Council’s approval is required. 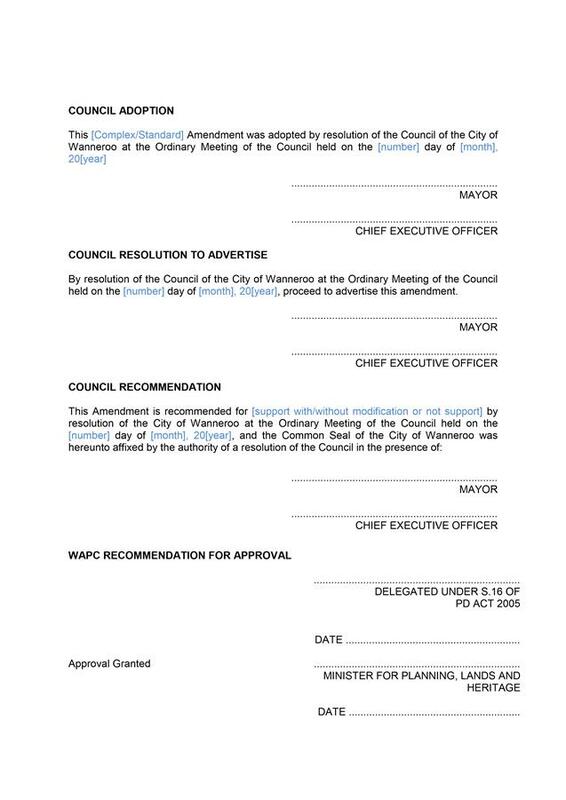 If Council approves this sponsorship, a suitable legal agreement will be prepared that will be authorised in accordance with the Execution of Documents Policy. 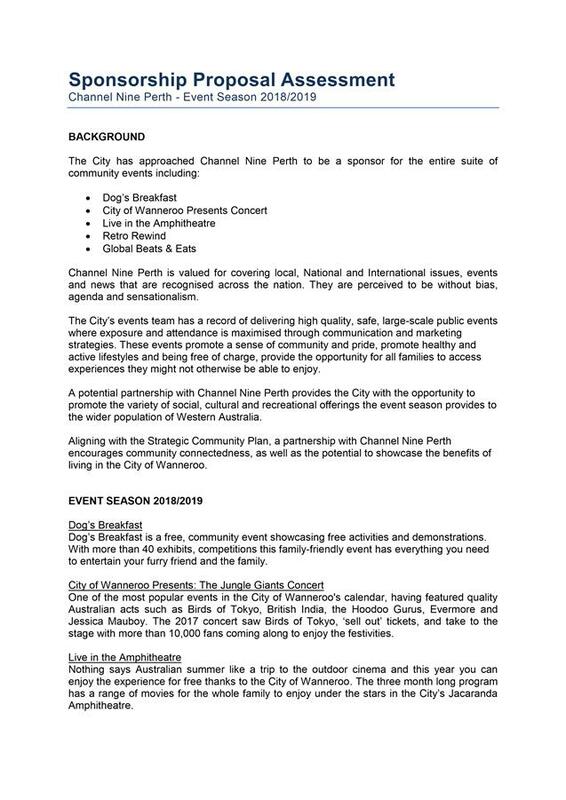 That Council APPROVES the sponsorship proposal received from Channel Nine Perth for the 2018/19 community event season as per Attachment 1.